Miriam Vale, a town and the administrative centre of the former Miriam Vale Shire, is 70 km south-east of Gladstone and 30 km inland from the coast. It was named after a pastoral leasehold first occupied in 1854 by Arthur Chauvel, who was inspired to name the property after his sister, Miriam Sally Emily. The shire's coast line includes Bustard Bay and an inlet to the bay known as Round Hill Creek. It was Captain James Cook's first Queensland landfall (May 1770) where, despite the unappealing flatness and dryness of the land, his botanists found numerous new plant species. Now marketed by the shire as the Discovery Coast, its central land form, Round Hill Head, comes complete with a commemorative cairn and a settlement named Town of 1770. 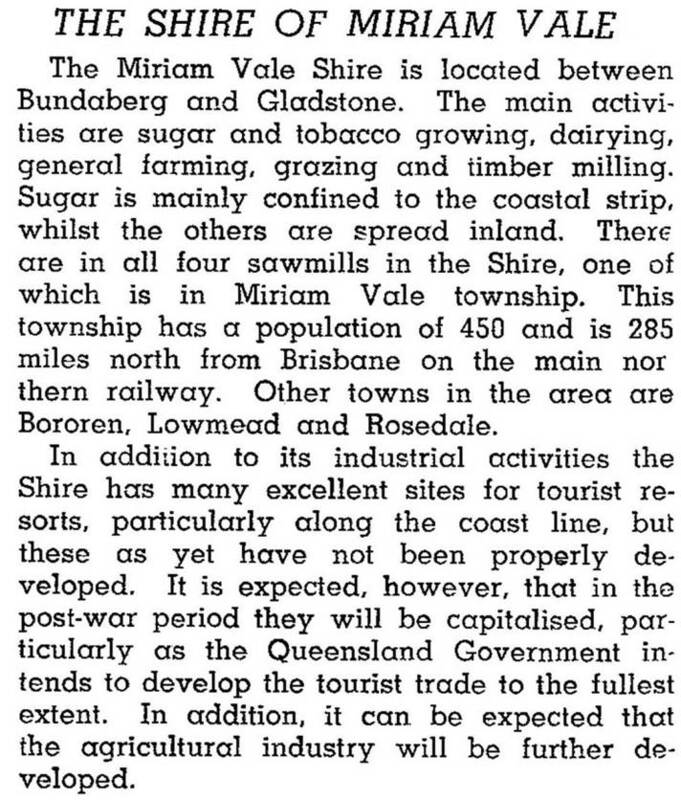 The Miriam Vale district was under the Calliope divisional board and shire - a shire adjoining Gladstone - until 1902, an indication of its relatively late development. The pastoral leaseholds ran sheep, and increasing numbers of cattle from the 1860s when pastoralists realised the harm caused by spear grass to sheep. There was also timber cutting, especially hoop pine in the Eurimbula 'scrub' near Bustard Bay in 1870s. At Bustard Head, the Queensland Government built its first lighthouse in 1868, a cast iron structure 102 metres above sea level. A school was opened there in 1888. The reference to tourism potential proved to be prescient. The inlets at Baffle Creek, Round Hill Creek and Rodds Harbour (north of Bustard Bay) provide calm waters for boating and fishing; the coast at Agnes Water, south of Bustard Bay, offers the most northerly surf beach on the Queensland coast before the protective influence of the Barrier Reef. The scrub and wallum country has provided sites for several national parks, notably Eurimbula, Mount Colosseum, Castle Tower and Rodds Peninsula. It is the surf, however, that has led to the most commercial development. Agnes Water (see separate entry) has over a quarter of the shire's population and a considerable retail and business centre. Together with neighbouring Town of 1770, the two towns have several accommodation sites and tour outlets. Agnes Water's population increased by more than one-third in the period from 1996-2001. Miriam Vale has a State primary-secondary school, bowling and golf clubs, a hotel and a motel, and a heritage-listed fig tree, planted at the turn of the previous century. Bororen has a State primary school and a hotel-motel.